As you learned in Part 1of this PhotographyTalk.com article, excellent digital photography of air shows is only possible if you plan and prepare in advance. Once you’re at the show, you’ll find the shooting tips in Part 2 equally important to create a complete story of the amazing action and excited crowd. You may want to make this part of your advanced planning and preparation if you have access to the show’s complete schedule, maybe on a Web site. The featured event or events, such as the U.S. Air Force’s Thunderbirds or the U.S. Navy’s Blue Angels, occur at the end of the show. Make a short list of the acts and events that are of primary interest to you because you simply can’t photograph it all. Consider attending the air show for more than one day. Cover the aerial events on one day, and then return the second day to photograph the various displays, close-ups of parked aircraft and people’s interactions and reactions. Arrive early to find and secure the best locations. You can identify the best digital photography locations by looking for the photographers with the most expensive equipment. You definitely want to be as close as possible to what is called the show center. This is where the show announcer is located and the center of much of the day’s activities. Pick a prime spot at the dividing fence where you can place your chair and umbrella. The PhotographyTalk.com article, Digital Photography—Why You Should Be Shooting Raw Files, explains why shooting RAW files are generally preferred. At an air show, however, you may want to shoot JPEGs. You will be somewhat limited in your editing options, but you’ll be able to shoot more images per memory card. A good rule to follow is to shoot at a shutter speed that is at least twice the longest focal length of your lens. If you are using a 70–300mm lens, then your shutter speed would be no slower than 1/600. The exception to this rule is when you are taking digital photos of a propeller-driven plane and helicopter. A fast shutter speed simply freezes the spinning prop, which makes it look as if the plane or copter is suspended in air, not in motion. Use a much slower shutter speed, 1/125 to 1/200, to slow the movement of the propeller, so your photo shows some of the arc of the tip. It takes some experimentation and practice to find the exact shutter speed, but that’s why you brought all those memory cards and you’re shooting JPEG files. Because there is so much action and motion, you’ll find continuous mode the best shooting mode. Switch to Av mode for your digital pictures of crowds or static displays. You’ll Make Mistakes, But Don’t Delete Them. 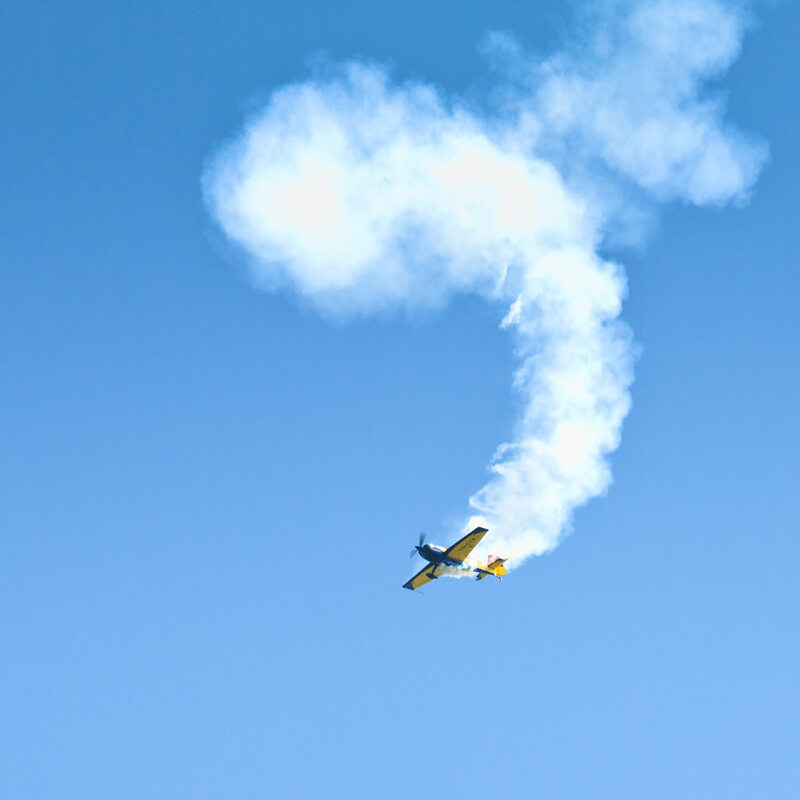 If you’re a beginner photographer or you don’t have much experience with air shows or shooting objects moving at high speeds, then you can expect to have a number of frames that are blurred or empty because you didn’t release the shutter while the plane was in the frame. Don’t waste time during the show to delete those mistakes. Some of those mistakes may be keepers, so wait until you’re in the calm environment of home to review and delete any images. Air shows are wonderful family outings, and a great opportunity to shoot unique pictures of their experience. Planning and preparation will allow you to enjoy the show, a day with your family and a unique digital photography opportunity.